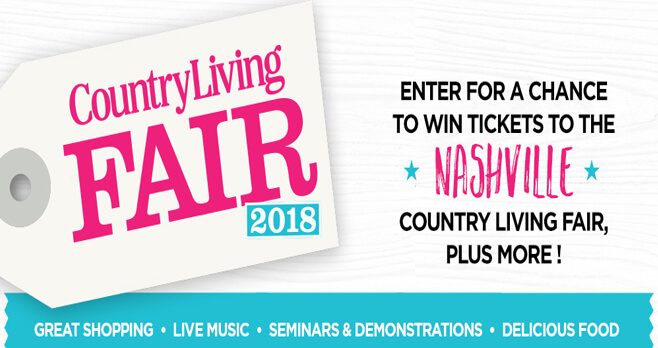 Country Living is sending one lucky reader and a guest to the Nashville Country Living Fair with the Nashville Fair Sweepstakes 2018. Enter online at nashvillefair.countryliving.com for your chance to win your tickets and $1,000 for travel expenses. Who Can Enter? The Country Living Nashville Fair Sweepstakes 2018 is open to legal residents of the 50 United States and the District of Columbia, who have reached the age of 18 in their state or territory of residence at time of entry. Legal residents of Canada (excluding Quebec) who have reached the aforementioned age in their province of residence at time of entry are also eligible to enter. When To Enter? Sweepstakes begins on January 30, 2018 at 12:01 AM (ET) and ends on April 5, 2018 at 11:59 PM (ET). What Is The Nashville Fair Sweepstakes Prize? The Grand Prize consists of two (2) admission tickets to the Country Living Fair in Nashville, TN from April 20, 2018—April 22, 2018 (ARV: $15), and $1,000 in the form of a check, which may be used towards travel/lodging expenses (ARV:$1,000). Who Are The Country Living Sweepstakes Winners? For the name of the Winner, send a separate self-addressed, stamped envelope to Country Living Nashville Fair Sweepstakes Winners’ List, Hearst Communications, Inc., 300 West 57th Street NY, NY 10019 within 2 months from the Winner notification date. I just entered the sweepstakes. Nowhere does it say anything about signing up for the magazine. I do not want the country living magazine and nowhere did I say I did. If you have to take it then withdraw my entrance. These are a ripoff. You can’t get anyone to order the magazine so when you enter a sweepstakes you automatically have signed up for a magazine. I do not want it so do not send me one. Thank you. I should no better than to enter any sweepstakes.